After opening in 2015, Black Crow Coffee established itself as a creative community space. In 2015, Bauman, along with Deana Hawk, opened Black Crow Coffee, at 772 2nd Street North. Almost immediately it was apparent that they’d need more space as the concept began to grow. So they began by taking over the next door space that was formerly occupied by Wild Lotus Yoga. A year later, in 2016, the pair began leasing space in Grand Central District to roast their own coffee. And with every bean they roasted, Black Crow's popularity grew, so much so that Greg and Deanna are now planning on opening a second location. 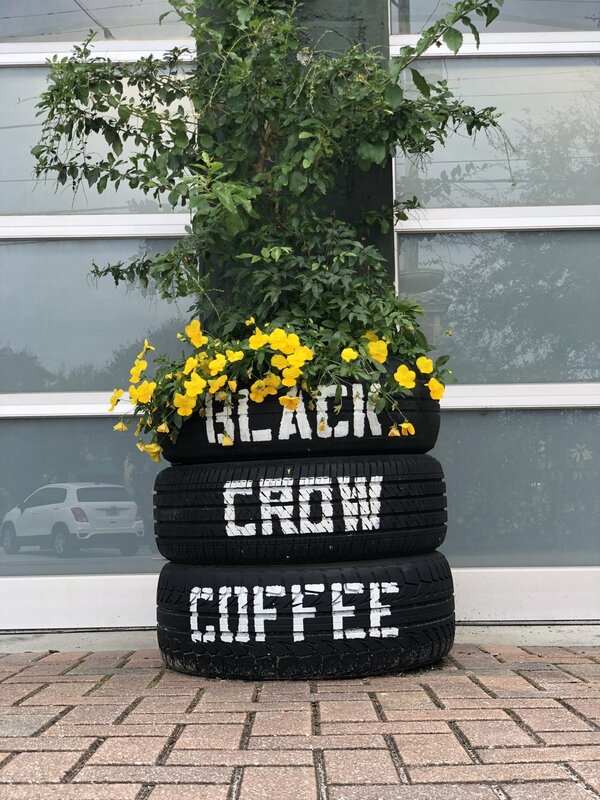 Black Crow’s second location will be at 24 22nd Street S, in the space formerly occupied by Calusa Press Co.
Later this month, adjacent to their roastery at 24 22nd Street South, the pair will officially welcome Black Crow Coffee's second location in a space recently vacate by Calusa Press. And in the spirit of the original, Hawk and Bauman hope to bring local art, music, community, and of course great coffee, to the booming Grand Central community located just west of Downtown St. Petersburg. Situated at the corner of 22nd Street South and 1st Avenue South, the Grand Central location provides ample street parking and easy in-and-out access for quick coffee breaks between errands or on the way to work, something the original location didn't afford. The space will feature two glass garage doors in the main seating area which will open to a spacious courtyard. Black Crow plans to host movie nights, good ole disco dance parties, and other community functions. “We’re always keepin’ it crow style!” quips Deana. Black Crow’s Grand Central location will feature local art, including these murals that were painted by artists from Creative Clay. Like the original, with its unique indie-bohemian style, the decor of the new location will pay homage to St. Pete by featuring chairs and tables from Brocante Market and will showcase murals by local artists and St. Pete organizations like Creative Clay. The space is airy and inviting and already boasts an impressive espresso machine that Deana is very eager to serve from. In addition to the new location and adjacent roastery, Greg anticipates building a recording studio for up-and-coming musicians on the northern side of the property in the near future. Black Crow Coffee will debut its second location on February 17th with an event that, keeping with their roots, features local artists including Walla Child, live music, and a few craft vendors. Be sure to check out their new location when it opens and keep in touch with Black Crow Coffee by following them on Facebook and Instagram.